When buying or selling cars it's often hard to determine the market value. A MotorWeb Vehicle Information Report will not tell you the value of your vehicle but you can do it another way. 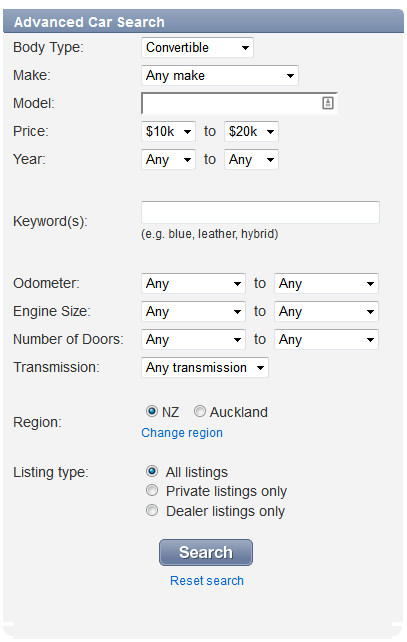 Trade Me's advanced car search enables you to filter by a number of options, including price, year and odometer. You can also filter by Dealer and Private Listings. If you are trying to determine the value for a common car such as a Toyota Corolla, there's a good chance you will be able to find a Corolla manufactured in the same year, with similar odometer readings.